HARLYM YEO: What's Up on 28th March? What's Up on 28th March? There are several events on business segment which i didn't post (AGM, EGM, etc). I only post those are not-so-business related events. Just to highlight, these events are purely for press members only. 1. Microsoft Malaysia to launch its Unlimited Potential website and also continues to empower NGOs with third Unlimited Potential Day at Bangsar Seafood Garden Restaurant, One Bangsar, KL at 8.45am. 2. USANA Health Sciences launches Nutrimeal at Level 2, Park View 3, Mandarin Oriental Hotel, KL at 12noon. 3. LCCT - KLIA 2nd anniversary celebration at Public Concourse Area, LCCT, Sepang at 3pm. 4. Academic Excellence Award ceremony for Taylor's high achievers at Taylor's University College, 1, Jln SS15/8, Subang Jaya, Selangor at 3.15pm. 5. 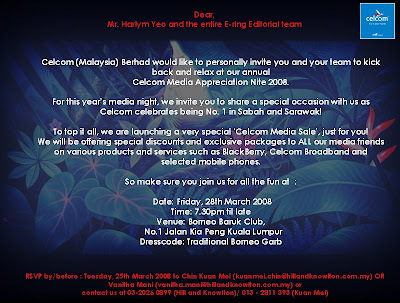 Celcom media nite at Borneo Baruk Club, Jln Kia Peng, KL at 7.30pm. (Dress code: Traditional Borneo Garb).